Sai-300 is Ushio’s short and medium-throw LED followspot. Its portable size and ease of use makes it an ideal lighting instrument for use in houses of worship, schools, ballrooms and multipurpose venues. In Japan, Sai means “beautifully colored”. Our unique phosphors vividly and accurately reproduce the natural colors of skin tones, costumes and backdrops as they were meant to be portrayed by the artists and designers. 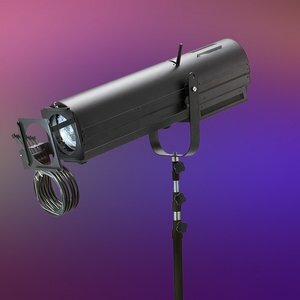 The 230W LED in the Sai-300 produces a high quality and powerful daylight white beam (5800K). The Sai-300 inherits the same design characteristics of balance, ergonomics and superior functionality as our xenon powered follow spot, the Takumi-2000A. Step-less dimming, 100% iris closure and a flash effect enhances operator usability.